Although Facebook is still the undisputed king of the social media ecosystem, it gets a fair amount of competition from other social media networks – the ones with a lot of visual content such as Instagram which, in fact, is also owned by Facebook and then there’s Snapchat, which has become a hub for media content. Well, Facebook is still the teenagers’ go-to social network, but Snapchat and Instagram have proved that they are able to paint any picture of themselves. Instagram Stories are insanely fun that’s because maybe it’s very much like the Snapchat’s My Story feature. Facebook may be the dominating the social networking world, there are other social networks like Snapchat and Instagram that are catching up with the trend. Facebook and Instagram were the frontrunners in the social media race until Facebook killed the competition by acquiring Instagram in 2012. Let’s take a look at the two most popular image-sharing applications to find out how they differ from each other. 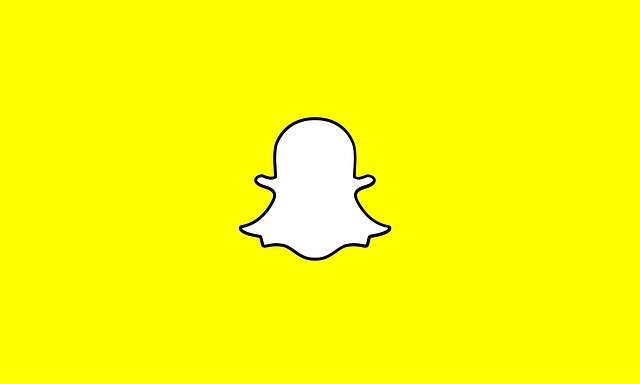 Snapchat is one of the popular social media apps among the teenagers community. Snapchat is the one app that comes close to communicating face to face than any other social app. Snapchat is all about those precious short-term moments you experience and enjoy on a daily basis. Let’s say when you accidentally caught up with an old pal, when you talk to your friends, or just passing by or living your lives – all these moments come in short bursts of time and eventually disappear. Snapchat is about living in the moment and having fun while doing so. What started as an idea that struck the minds of Evan Spiegel, Bobby Murphy, and Reggie Brown, has now become an internet sensation with more than 100 million active users around the world. It was initially launched as “Picaboo” in 2011 but was later rebranded to “Snapchat”. The idea of “disappearing photos” is what makes Snapchat so unique and fun. The photos disappear after a short period of time which is just like letting everything go eventually. Instagram is a popular photo-sharing application owned by Facebook. It allows users to capture and share high-quality photos and videos either publicly so that the world could see, or privately within a closed circle that share your interests. Instagram came a long way from a small startup with a few experimental snaps in 2010 to a social media phenomenon with a community of over 400 million active users around the globe. It was created by Mike Krieger and Kevin Systrom as an iOS-exclusive mobile app and has now become of powerhouse of photo and video content. The idea is to transform an amateurish mobile photo into an artistic, studio-quality image and Instagram does that quite well with filters. It can be also used in real-time so that you could share your best moments and experiences with the world as they happen in real time. The popularity of Instagram catapulted after its acquisition by Facebook which in fact took the already popular photo-sharing app to new heights. 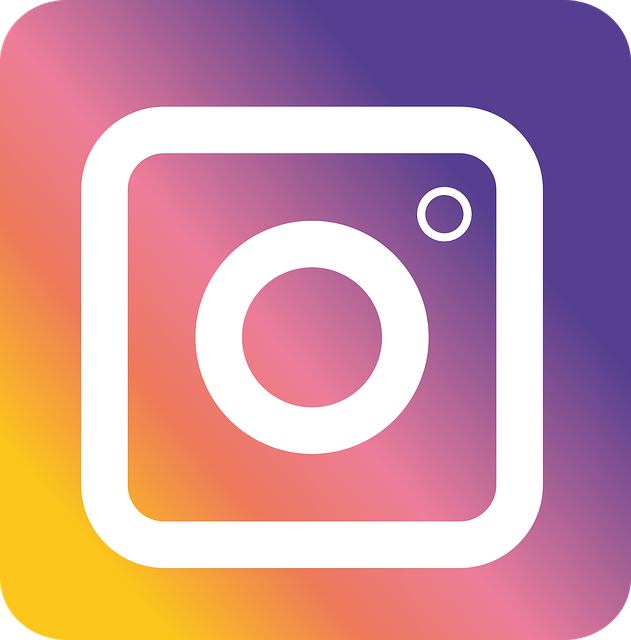 Instagram is a photo-sharing app with a strong emphasis on photos or videos. It’s all about adding filters to transform your amateur photography into artistic marvels. Snapchat is also a photo/video sharing platform with a similar purpose, that is to capture and share image and videos, but the way it does that is quite different. Snapchat is more of an image-based messaging application that emphasizes on chatting/messaging over snaps which is not a primary feature of Instagram. Snapchat and Instagram both allow users to capture and share photos and videos with a selected list of recipients or publicly for the whole world to see. Both serve the same purpose except Snapchat does that with a fun twist – the disappearing photos. The photos and messages appear for only a short span of time before they disappear. The concept of disappearing photos and videos in Snapchat is based on the “living in the moment” principle. You can view the stories at the top of the main Feed which automatically scroll from one person’s to the next on a horizontal bar. It shows the profile photos as cyclic bubbles of users you follow on Instagram and you can tap on the screen to skip to the next photo or video, or swipe left or right to switch between different feeds. You can swipe right from the camera screen to reach the stories tab on Snapchat. It’s almost similar to Instagram except the videos disappear as soon as they end in Instagram. Instagram Stories are public if your profile is public regardless of whether you follow a particular user or not. You can even view the stories of people you don’t follow on Instagram. However, the new “Story Settings” would allow you to hide your stories from specific users or allow them to be seen only by the people you follow. Snapchat gives a total control of who you do and do not want to view your stories. Snapchat and Instagram are the two most popular image sharing apps that popularized the photo/video sharing trend you are seeing on other social media applications such as Facebook and Twitter. Both serve the same purpose, that is to capture high-quality photos and videos and share them ether publicly for the whole world to see, or privately within a closed group of friends or family, but they do that very differently. Unlike Instagram, Snapchat profiles are very basic with a little more than your username and profile picture and the idea of disappearing photos and videos is something that makes Snapchat a global phenomenon among millenials. Sagar Khillar. 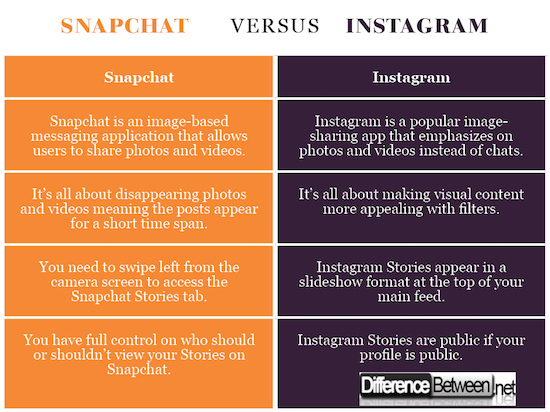 "Difference Between Snapchat and Instragram." DifferenceBetween.net. April 5, 2019 < http://www.differencebetween.net/technology/difference-between-snapchat-and-instragram/ >.